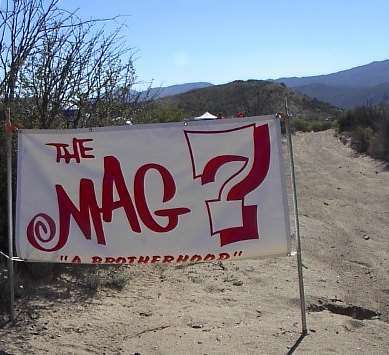 "Finally getting around to publicly thanking Mag 7 for exceptional service at the 500. My nephew apparently overheated the 99A DS 650 somewhere after Borrego. A bike racer stopped to check on him, then stopped at the next Mag 7 pit and let them know he was stopped. Someone came out from the pit on a bike, met him on the course (he was moving again) and followed him to the pit. There they checked over the quad and made sure my nephew was OK (it was godawful hot out there) before they sent him back out. This was way above and beyond what I would have expected from a pit service. Just wanted to put the info out there to help anyone trying to decide which service to use at the 1000." 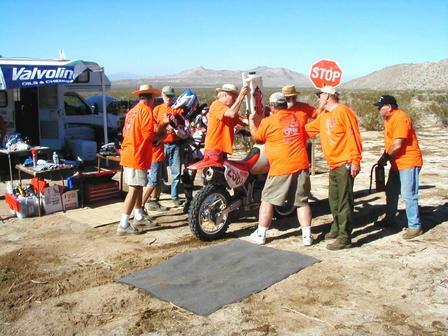 This article offers information for the first time Baja racer. Click to view a .pdf with information on what to expect when racing with MAG 7. "MAG 7 is the most prepared and equipped pit organization in the desert." Here is a list of various frequencies used by Baja race teams, and some suggestions on radio set-up. MAG 7 uses 153.380MHz. Our MAG 7 "HERE" sign at each pit. A similar one is also 1/4 mile before the pit, and 1 mile from the pit. 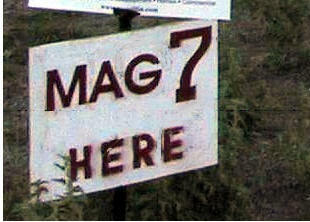 A distinctive MAG 7 Banner is also located at each pit. All MAG 7 pit crews wear the bright orange shirts. You'll see orange everywhere on the race course, as MAG 7 goes where no other pit organizations will. Want your own orange pit crew team shirt? Talk to Thomas about joining MAG 7. Basic skills and a great sense of adventure are all you need! Click on the link below for a list of the various bike, quad, buggy, and truck classes that SCORE has defined. Click Here to view a .pdf list of the pit gear we take to every pit. (high-octane or pre-mix) from dry-breaks, dump cans, or jazz cans. Already using BFG or Honda pits? Sign up with MAG 7 Emergency Support Service in addition to your current pit service to ensure you have help WHEN and WHERE you need it. We have more pits located around the race course than anyone else. It's inexpensive insurance for a fast finish. MAG 7 pits seem to be everywhere! Located at 50-60 mile intervals up and down the racecourse, we'll be there WHEN and WHERE you need us. There are a lot of fuel options available to the racer, and MAG 7 has teamed up with VP Racing Fuels to deliver quality fuel and a flexible range of octanes. We do not supply pump-gas. Click Here to read why we supply only Racing Fuel. If for some reason you do not use fuel you purchased for a race, you may go to the pits and pick-up your unused fuel. After the race, MAG 7 pit captains cannot haul the fuel back into the United States, so you must meet them at the pit before they close down and depart. Good Luck from the MAG 7 Brotherhood!